This is not a post about cleaning, doing laundry, or even about looking after the cats (yes, that counts as housework normally). The kind of house-work I’m talking about is more along the lines of minor renovations. When the house went in, nine months ago, there were some casualties – a few trees had to go to make room for the trucks to come in. The contractors knocked them over, and (at our request) left them for us to deal with. We collected a few sections and painstakingly de-barked them on the verandah. They’ve been drying out and seasoning since then, in preparation for being moved indoors as combination ornamental pillars (sort of a ‘whole-tree architecture‘ thing) & cat climbing toys. 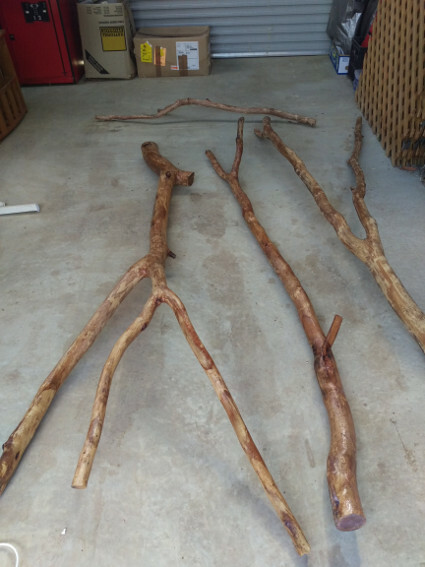 Yesterday I sanded the tree sections, and treated them with borax (wiped them down thoroughly with a borax solution of about 400g in about 8 L hot water, with some soap added for good measure). Today the fist coat of varnish went on, so after another coat of varnish they can be installed. We’ve also been working on putting up sliding doors on the guest room / media room / meditation dojo (it’s a multi-purpose room, depending what we need). The idea is something that looks like Japanese-style rice-paper sliding doors but is a little more resistant to destruction by cat. And since we do have a house-guest arriving next week and staying with us for a couple’ve weeks, it seemed like a good time to do something about the door situation. The other thing we did yesterday was tidy the workshop and the garage. Which took most of the day, and left us exhausted – but with a sense of satisfaction. It’s much more usable now, and our bicycles have a proper space in the garage instead of being shoved up against the wall between boxes. What are using for the sliding doors? We had planned to use standard timber doors, as purchased form a hardware store – but it turns out that standard doors are not 900mm wide, even thought standard doorways are (the doorways allow for doorframe etc.) so we’ll have to construct custom doors. That’s not so hard though, since they’re internal doors. A bit of carpentry. I’ll post about them when we’re done.